Who's Blocking the L Street? 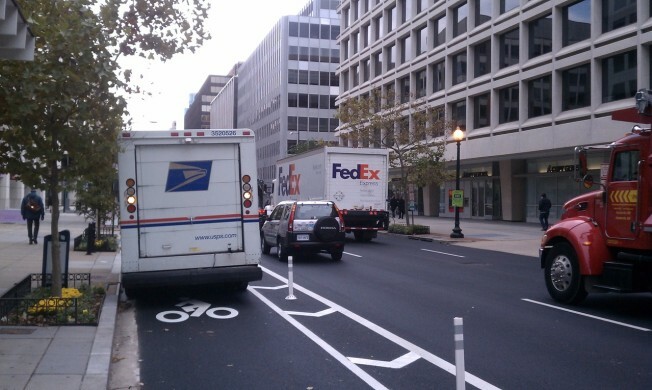 A new Tumblr is seeking to shame drivers who use the new bike lanes as a parking lane, DCist reports. "Who's Blocking the L St. Bike Lane Today?" pictures vehicles -- including passenger cars, Fed Ex truck, a city police van and a truck with a Gepetto's Catering logo -- blocking the lane that's supposed to be dedicated to bike riders. In practice, this would force cyclists to veer into car lanes. The bike lane runs from New Hampshire Avenue to 12th Street. Blocking a bike lane with your car carries a fine of $65, DCist notes.